On November 15 Space X planned a special Earth Orbit flight carrying a highly secret payload. The payload was so secret that no government agency would claim it, nor were any details released by either Space X or Northrop Grumman, the sponsor, or the National Reconnaissance Office responsible for intel gathering from space. Although the payload is being launched for the National Reconnaissance Office, the mission's press kit offers absolutely no details about the payload. The NRO has denied that Zuma is its satellite. Space X did reveal that Zuma is NOT related to their ambitions to go to Mars, despite hinting of this on their website and Elon Musk’s known Mars lust. In 2016 Musk marketed his ambitions, stating he is going to establish cities on Mars, colonize Mars, and this is all do-able. Just send your money to him, and he will make all this possible. Per the Zetas, Musk had been engaging in good old fashioned hucksterism - raising money for himself, while making promises. This is a money making endeavor by Elon Musk. The dates are all set out far enough into the future that he will not be challenged to deliver any but showy demonstrations on the Earth’s surface. Meanwhile, as the Earth changes progress, scaring the wealthy class, he will collect their funds. This will allow Musk and his cohorts to arrange a kingdom on Earth – secure, well stocked, and very high tech. This is hucksterism at its finest, a complete con job. He knows from the smackdowns that the Council of Worlds has given him that he cannot setup on Mars, the latest the dramatic explosions of the FaceBook satellite launch. and negotiations might be in process. The timing of Zuma’s launch was also oddly connected to the Asia meetings the week before between Putin, Trump, and Xi. As usual, only the Zetas can explain. The aerospace and defense company Northrop Grumman arranged Zuma's launch on a SpaceX Falcon 9 rocket for the government. SpaceX representatives have not released any details on the exact orbital destination of Zuma, nor of the payload's specifications or intended use. Zuma's launch will mark the third classified mission for SpaceX for the U.S. government this year. NASA engineers were stunned: For the second time in two years, a high-value Earth science mission had been lost to a launch failure. The payload fairing, as it is technically known, had failed to split apart again, trapping the satellite in a shroud that dragged it to a watery grave in the Pacific Ocean. It was potential concerns about fairings that led SpaceX to postpone this week’s planned launch from Kennedy Space Center of a secret U.S. government mission called Zuma on a Falcon 9 rocket. The company said it stood down to review the results of fairing tests performed for another customer. SpaceX stated that it had decided to stand down from the launch as it reviewed data of a fairing test the company did for another customer. the closely shrouded body of Nibiru can be clearly discerned. But by October 22, 2017, a year later, the Dominant Moons can also be seen just above the body of Nibiru, as well as a complete String of Pearls. via webcams in Italy and France. A dramatic capture of Nibiru’s double helix of the two dominant Moon Swirls, which trail closely behind Nibiru on either side, was first captured on September 8, 2014. At that time, the double helix showed up as dense red dust, but now by October 12, 2017 the Dominant Moons, the center of each swirl, can be discerned. The Nibiru complex has come closer. 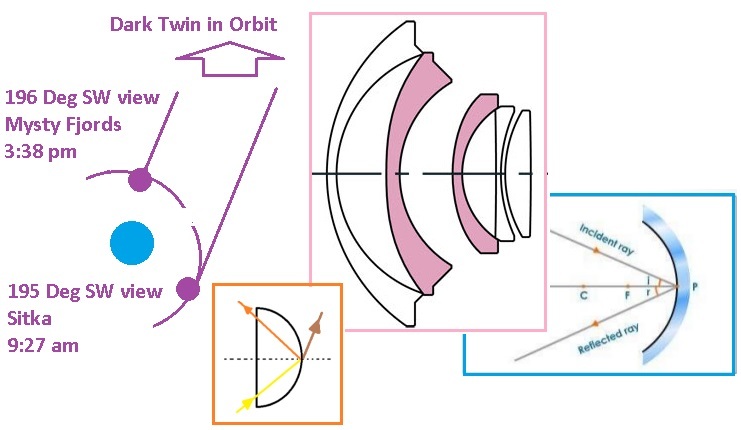 The Dark Twin and Venus are also looming closer, caught in the cup formed by particle flows from the Sun swirling past Nibiru to create a particle void in front of Nibiru. All this crowding is offset by the gravity Repulsion Force, which keeps large bodies apart. But the crowding eventually forces an escape from the cup during the Last Weeks, when Venus moves along in her orbit and the Dark Twin slips behind the Earth to likewise move along in its orbit shared with Earth. Can this time be determined from image captures? of this Newsletter we featured a Monster Dark Twin persona capture taken on August 8, 2017 at 3:38 pm by a South facing webcam along the British Colombia coastline. This monster Dark Twin persona also makes an appearance in some of these FAA cams in the late morning, due to a reflection in the domed glass covers that wide-view cams use. Sitka, also in the far North, shows this at 9:27 and 9:37 am, clearly a glancing reflection on the protruding lens and not from an object directly in front of the cam. Can we determine the Dark Twin’s location in Earth’s orbit from these and other images? Once again, distance is hard to gage from a 2D image, and the Dark Twin may no longer be precisely in the orbit path as per the Zetas, it will drift behind the Earth, attempting to pass the Earth. It is free to move, to evade particle flows, and adjust to any new positions Nibiru or Venus or the Earth might assume. But that it has come closer is clear. The Dark Twin has come up behind the Earth in their shared orbit, and there stopped, halted like the Earth. Because of the increased crowding in the field in front of Planet X, which is moving steadily toward the three planets trapped in the eddy flow cup, it has dropped slightly behind the Earth's orbit. If one were to look down upon the solar system one would see coming out from the Sun first Planet X, then Venus, then the Earth, and finally the Dark Twin. The Dark Twin is somewhat further from the Sun and to the side of the Earth, behind the Earth in their shared orbit. The Dark Twin on occasion is captured on film as a dim monster when light rays which have been bent out are returned to Earth, distorting the original size. was used to avoid having to explain how and why the citizenry would be starving and stumbling about. But are there such things as Zombies, as the many movies and TV series present? Many cultures report that the newly buried can emerge and indeed, stumble about in a mind-less manner. In the Congo they are called Nzambi. In Norway these Zombies are called Draugr. In China they are called Jiang Shi. And in Haiti according to VooDoo black magic, the process is supposedly created by a drug that slows the heartbeat and breathing so the human is buried, but can be dug up again and reanimated. Brain dead from lack of oxygen, they act like the Zombies of mythology. Norse mythology describes the draugr, which is a revenant or undead creature. The word draugr means “again walker.” They live in their tombs, but can escape to visit the living to find victims. Draugr are generally very large and swollen, ugly, and black. If someone is bitten by one, the bitten person can become a draugr. The Norse monster kills its victims by crushing them or eating them alive, flesh and blood. However, unlike the more modern zombie, the draugr has a variety of supernatural powers. This undead creature can shape-shift and can also drive someone mad or enter into their dreams. In China, the Jiang Shi, which is Chinese for “stiff corpse,” combines the attributes of the zombie and the vampire. The Jiang Shi are often people who had been the victims of suicide or murder. They can look more or less normal, if recently dead, or their bodies can have mold and decaying flesh on them. The Chinese zombie moves by hopping. History shows that this idea dates back to the 8th century. The word ‘zombie’ is said to have come from nzambi, which in Kongo means ‘spirit of a dead person’, or zonbi, used in the Louisiana Creole or the Haitian Creole that represents a person who died and was then brought to life without speech or free will. Voodoo folklore contends Voodoo priests posessed the ability to ressurrect the deceased through the administration of coup padre—coup padre is a powder that is issued orally, the primary ingredient of which is tetrodoxin, the deadly substance of the notoriously poisonous fou-fou, or “porcupine fish.” Once they had been issued the coup padre, the subjects being prepared for their descent into zombidom would appear to die insofar as their heart rate would slow to a near stop, their breathing patterns would be greatly subdued and their body temperature would significantly decrease. Can people be buried alive? In the past, before modern medicine could measure brain waves and the faintest heartbeat, this was possible. 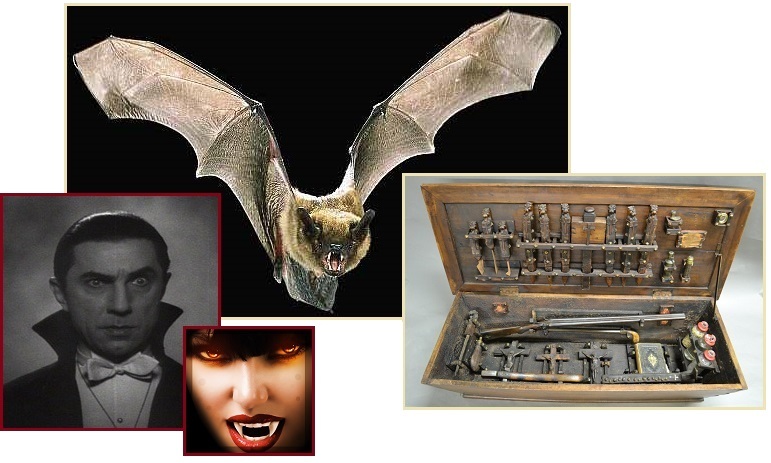 Thus in past centuries coffins would be fitted with bells, so the reawakened could alert those above. What of the Zombie legend that an infection is responsible, so in the movies there are both healthy humans and hordes of Zombies? If the dead are buried as a result of infection, such a spread of infection could occur. The Norwegian Draugr reportedly would infect others by a bite. During the current Plague outbreak in Africa, the custom of opening tombs to dance with the dead is related to the spread of the disease. 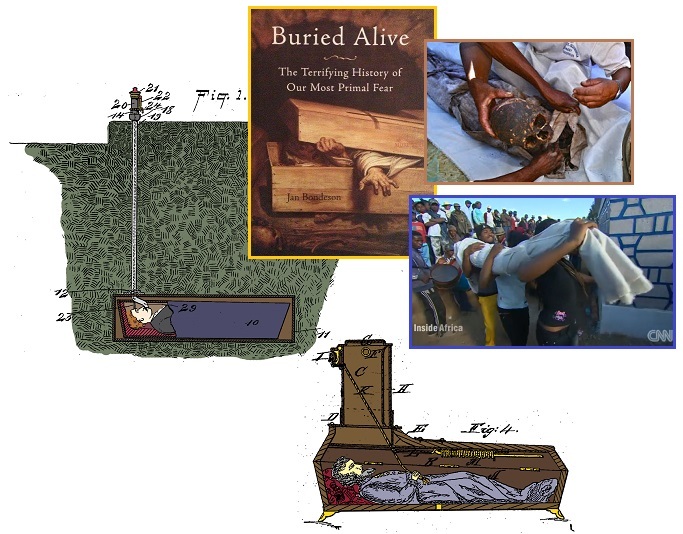 A safety coffin or security coffin is a coffin fitted with a mechanism to prevent premature burial or allow the occupant to signal that they have been buried alive. A large number of designs for safety coffins were patented during the 18th and 19th centuries and variations on the idea are still available today. The fear of being buried alive peaked during the cholera epidemics of the 18th and 19th centuries but accounts of live burial have been recorded even further back. When his tomb was reopened, the philosopher John Duns Scotus (1266 – 1308) was reportedly found outside his coffin with his hands torn and bloody after attempting to escape. The fears of being buried alive were heightened by reports of doctors and accounts in literature and the newspapers. As well as dealing with the subject in "The Fall of the House of Usher" and "The Cask of Amontillado", Edgar Allan Poe wrote "The Premature Burial", which was published in 1844. It contained accounts of supposedly genuine cases of premature burial as well as detailing the narrator's own (perceived) interment while still alive. There is no virus that creates this state, as the near-death state can occur due to any disease or debility, and this certainly includes starvation. The starving body attempts to preserve itself until circumstances change, thus allows the temperature to drop, and the afflicted to slip in and out of consciousness. 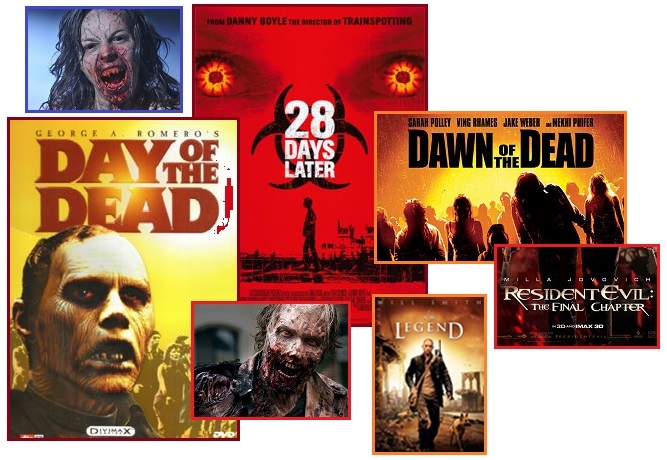 Most of the movies and TV series show normal humans living side by side with packs of zombies, who hunt them continuously. How would such a situation arise, in today’s modern world? We have detailed how those living in cities will starve, and the horrors that might emerge. Take a clue and leave the cities early.